Our anti-stress supplement Adaptix offers the benefits of eight adaptogen herbs, so-called because they act specifically in the body to enable it to adapt to various stress factors. In other words, these plant extracts help increase the body’s general resistance to stress. Once ingested, extracts of adaptogen herbs act in various ways by modulating the hormone, immune and nervous systems, as well as blood pressure and body temperature. 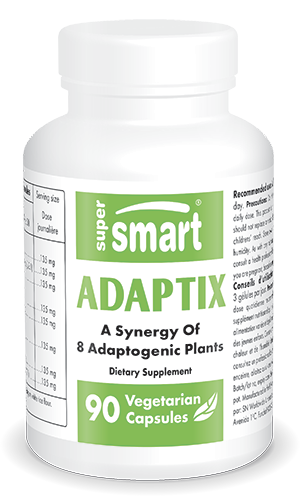 In regulating these vital functions, adaptogen herbs combat a number of stress factors, which is why Adaptix has been formulated to combine eight different such herbs in a single capsule. This unique blend delivers the benefits of these herbs’ adaptogen properties for combatting stress, relieving symptoms of fatigue and promoting general well-being. suma (Pfaffia paniculata), better known as Brazilian ginseng, is traditionally used to fight the effects of stress. With its adaptogen and tonic properties, it’s known for restoring energy and vitality. As well as reducing stress and fatigue, some of the herbs in Adaptix can promote mental well-being. Astragalus and Korean ginseng, for example, are known for their neuroprotective effects. Along with rhodiola and schisandra berry, these two herbs also have stimulant properties which help support mental performance. Some studies have shown that schisandra berry may help increase concentration, coordination and cognitive performance. As for rhodiola, it may improve capacity for work, learning and memory. Combining the properties of these eight plant extracts, our adaptogenic herb supplement Adaptix is perfect for combatting the effects of stress. Formulated from high quality natural extracts, it comes in easy-to-take capsules. The optimal strength of the extracts means the recommended dosage is three capsules a day, though this can be adjusted in line with your needs and the advice of your therapist. You may also be interested in other adaptogen supplements from the SuperSmart catalogue: Magnolia Extract, Super Maca and Super Shilajit.